WHASA has accomplished 12 Years of consistency with the vision and mission to care for those with wounds. A dynamic team with more heart than time, a drive to help others to do the right thing guided by a VALUABLE INCLUSIVE Constitution and generous support from South African trade, has brought WHASA to where it is right now. WHASA Regional; African and International events with memorable Speakers and proven attractive capabilities motivated, inspired and paved a bright Roadmap to further WHASA Perspectives. WHASA achievement towards standing alongside international entities with regards to the establishment of benchmarked clinical practice, is still in its infancy. MEMBERSHIP RECRUITMENT and CONSOLIDATION STRATEGIES for individual & corporate members. WHASA accreditation with the HPCSA, NCSA, DoH. Final Consensus documents endorsement by all affiliated or associated organisations. EDUCATION FRAMEWORK defining the REGIONAL INTEGRATED ACTIVITIES for the 2016-2017 CALENDAR. 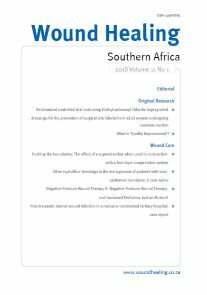 Clinical practice improvement by combining the effort of the EDUCATION & PUBLICATION COMMITTEE to secure and source South African articles for publication in the Wound Healing Southern Africa Journal. By “THINKING OUT of the BOX”’ and developing a clear ROADMAP during this time of transition, WHASA can remain as a source of inspiration and support to our members. The recent WHASA Trade meeting has shown on-going commitment from our current Trade members with a willingness to help in securing the way forward for WHASA. Increased Regional activities (Seminar-Workshops) ranging from BASIC to ADVANCED wound care themes to uplift skills in the public health sector were identified as the most important short term actions for the exco. Not only will it improve practice outcomes; but add on membership numbers and provide a pathway for those without resources to have consistent exposure to best wound care practice teaching. We are looking forward to the coming 2 years where the physical conceptualizing of teaching pathways to establish basic and advanced educational content packages and the validation of the competent wound care clinician, are the two single most important practice items we need to establish and put into the hands of our members. Only in doing this our full house mission of cost efficient best practice delivery can be expanded to an ever- GROWING community of WOUNDED persons. Acquiring the support of the existing Wound Specialists in a new partnering model can expand this vision and add on the availability of both healing- and helping hands to drive these initiatives to fruition.